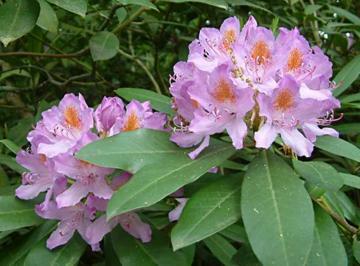 Vigorous evergreen with dark green leaves and trusses of mauve to lilac-purple flowers, often with brownish markings inside, in early summer. 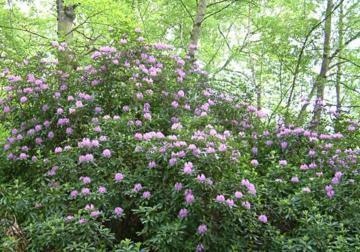 Can be very attractive when flowering in mass plantings. Quite variable and may hybridise with garden cultivars. Very resilient and tough once established, will grow in deep shade such as under Beech trees, where little else will survive. However it can become invasive in some areas and now has a bad reputation for displacing native species. Useful for shelter belts and large hedges. Found wild in Northern Turkey, Caucasus, Lebanon, Bulgaria, Spain and Portugal but also naturalised in other areas such as part of Western Britain.